Monday, our first winery day, began with Hampton Inn breakfast in the dining room off the lobby. It’s part of the deal when you stay at a Hampton Inn that breakfast is included. And we weren’t alone in partaking. Joining us were Little League baseball teams from Seattle suburbs Woodinville and Mill Creek that had come to Walla Walla for a state-wide tournament. They were pleasant kids, around 10-12 years old. And breakfast, well, what’s to complain about? It’s free. And the selection is excellent: egg and cheese omelet, sausage patties, potatoes in one station, with oatmeal nearby; toast your own bagels and English muffins and toast in another station, with pastries and make-your-own waffles; cold cereals, milk, juice, hard-boiled eggs, citrus and pineapple fruit mix at a third site. But the quality doesn’t exactly equal the selection. At 9:30, our nine wine tour participants gathered for the first time. Recall from my earlier post that we had bought this tour at an auction, with everything included. Joining us were friends Russ, Tobae, and Cynthia. As part of the deal, we got to have the company of Julie and Stan, an archaeologist/geologist couple who, happily, happen to be friends as well. (She’s the director of the museum whose dinner-auction we attended; buy the auction item and you get the director too!) Jay of Imbibe Wine Tours would be driving us around. And Philippe, owner of Oak Tradition — purveyor to the trade of barrels, corks, and much more — would be our wine expert. Given that we all couldn’t fit in the Imbibe Tours vehicle, two at a time would take turns riding with Philippe. 1. Walla Walla Vintners. This was our first stop. And like all but one of the eight winery stops we made, it was special. No simple walking into the tasting room, sampling the standard suite of wines, and heading out. We got behind-the-scenes insights at each place. Here, Judah took us out to the vineyard to look at the vines themselves. We spent about 45 minutes learning about the different grapes, soils, micro-climates; the dry farming they choose to do, in a location that receives sufficient rain most years to allow this, though most valley wineries irrigate at some point in the season; the pruning of the vines; the crew that does it; and so on. The setting was beautiful, with the Blue Mountains in the near distance, and famed Leonetti vineyards starting just a couple of hundred yards away at the edge of the Walla Walla Vintners plantings. What’s the story with terroir? This framed much of our discussion, with Stan giving us his own wisdom, based on a lifetime in geology and some reading on the issue. His own view: the minerals aren’t really going to make a difference in themselves. What counts is the water, how much is absorbed, where the vine sits with respect to the slope, how much water drains off, when the frost comes, what the microclimate is. Stan also gave us a lesson on the geology of the region, most notably the Missoula Floods, as touched on in my previous post. Then it was time to go into the tasting room and try the wines. Oh, actually, Judah started us there with a Sangiovese that we brought out with us to the vineyard to sample while we talked. That’s not a typical wine of the valley. The principal grapes are those of Bordeaux: cabernet sauvignon, merlot, etc. 2. Buty Winery. Next we drove back toward town and on north to the airport, adjacent to which are old Army buildings from World War II, some of which house Buty. One small building is home to the tasting room, where David gave us detailed explanations of the current releases in their Buty line and their more experimental BEAST line. (Buty is a family name of the owners; BEAST, well, they couldn’t resist.) We tried several reds and a couple of whites. I thought we had quite a thorough tasting experience, and expected us next to head to the next winery for lunch, so I was surprised when David closed up the tasting room in order to walk us two blocks over to the building where they make and store their wines. We tasted a wine still months away from bottling, looked over the barrels of wine, and learned more about what the winery does. 3. Waters Winery. On to Waters, a ways out of town, and again in a lovely setting. And time for lunch, before learning anything about the winery. We sat outside in a small patio area, where we were served a most delightful lunch provided by Olive Catering, with Waters’ wine as accompaniment. Olive Catering is an extension of Olive Marketplace and Café, in the heart of Walla Walla. They provided us with sandwiches (prosciutto, salami, chicken, turkey, vegetable), chips, water, and a dessert tray (brownies, lemon bars, a pistachio tart concoction). As we sat outside on a glorious day, in the heart of the Walla Walla Valley, mountains in the distance, Philippe filled us in on the history, tradition, and economics of the wine barrel business. Shortly after we began our lunch, in what had been the most peaceful of settings, things got real noisy. But our seeming bad luck was good luck as well, for it was bottling day. Waters, like all the wineries we visited, is a small operation. A winery we would go to the next day produces 1000 cases a year. More typical of the wineries we visited is a production of 3000-5000 cases a year. Waters was somewhere in that range, maybe 3000. At that level, it doesn’t pay to have your own bottling equipment. Instead, you pay one of several mobile bottlers in the northwest to come by with a bottling truck, an entirely self-contained operation, provided you supply the wine and the labels. Maybe the corks too. More on bottling soon. But first, some arithmetic. As Philippe explained, there are two traditional barrel sizes, 225 liters and 228 liters. Let’s go with 225. At 750 ml/bottle, that’s enough wine for 300 bottles. And at 12 bottles/case, that’s 25 cases. So 40 barrels yield 1000 cases. 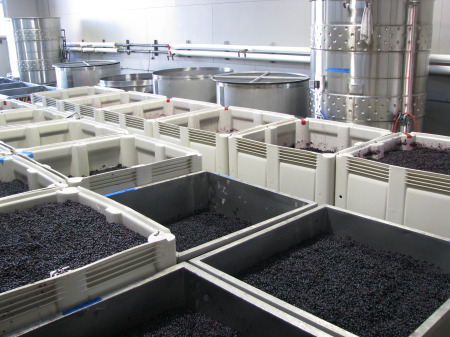 A 3000-case operation requires 120 barrels of wine each year. After lunch, we bypassed the Waters tasting room and went straight to the larger nearby building where all those barrels sit. Our guide, the assistant winemaker, took us to the two principal barrel storage areas to taste wines out of the barrel from 2011 grapes. Then, the bottling racket proving irresistible, he led us out the open door to the truck and got the bottlers’ permission for us to poke around. That was great. A hose ran from the building to the truck, where bottles were automatically filled, then corked. We were able to climb a small stairway to the side of the truck, where we could see the bottles make their way from the corking area to our left to the labeling area to our right. In-between, two men put on those wine bottle top things whose name I can’t remember and a machine sealed them tight. Once the label was put on, the bottles made their way to the rear of the truck, where men put them in boxes, which a tape machine sealed shut. From there, a conveyor belt brought the boxes to a ramp, which they slid down to a level area, where more men lifted the cases off and stacked them on pallets. At about 80 cases per pallet, or almost 1000 bottles per pallet, each of those pallets represented a lot of money. Waters hadn’t planned a tasting for us in the tasting room itself, but we stopped by briefly on the way out to sample and buy some. (We’d been buying at every winery.) Then we loaded up and moved out. 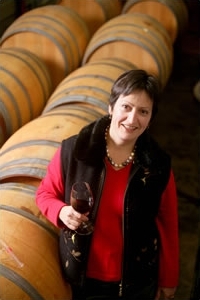 After earning her masters degree in enology and viticulture at the University of Dijon, Marie-Eve Gilla received practical training at local Burgundian wineries and vineyards. In 1991, she came to the United States to further her winemaking experience. Intending to stay for just a few months, she realized the incredible opportunities available in the wine industry. Now after more than ten years of making premium wines in the Northwest, she has come to appreciate the incredible growing conditions we enjoy in Eastern Washington. Marie-Eve took us back to see all phases of their wine-making operation, from the area outdoors where the grapes arrive and are crushed to the initial storage tanks and the barrels. She had quite a lot to say, as did Philippe. At the end of our walk, she and Anne had wine and cheese waiting for us, along with still more wines to try. They were so generous with their time and knowledge. It was a great visit. We had a short ride back to our hotel, then took a break before heading into town for dinner. Gail had decided days earlier that we should try Whitehouse-Crawford, which by all accounts was one of Walla Walla’s top restaurants. It’s closed on Tuesdays, whereas many other restaurants close on Mondays, making Monday the obvious night to go there, and so we did. The restaurant is housed in an old lumber planing mill and furniture factory (see here for the history), rebuilt in 1904 after a fire. Almost torn down in 1988 for parking, it was rescued and restored to house the current restaurant, as well as a winery. Sharing the space is Seven Hills Winery, which is run, if I got the story right, by the sister and brother-in-law of our driver Jay. From within the restaurant, there are interior windows looking into the winery, which adds to the character of an already character-filled restaurant. It’s really a wonderful space, with high wood ceilings and historic photos on the walls. Walla Walla Valley is home, of course, to more than fine wines. There are, for instance, the famed sweet onions. We didn’t have to work hard to reach the decision that we should share a basket of crispy fried sweet onions to start. In addition, I had the warm spinach salad with smoked trout, bacon, grilled onions and mustard vinaigrette. For my main dish, I went with the Oregon beef tenderloin steak with red wine sauce, mushrooms, and shallot-thyme mashed potatoes. (The grilled pork shoulder with harissa, cilantro, carrot puree, and spring vegetables sounded good, and there was Copper River salmon too.) Gail had a wild mushroom pasta dish that I don’t see on the online menu. Everything was superb. I decided to skip dessert, but everyone else ordered. By that point, a once-packed restaurant had mostly emptied out, yet we waited nearly half an hour after ordering for dessert to show up. I don’t know what the problem was. Gail had a peach dessert that again isn’t on the online menu. I took a small taste and would happily have eaten more. Except for the delay, it was a perfect evening. A perfect day too, for that matter. Lunch and dinner had spoiled us. Hampton Inn breakfast just wasn’t in the same league, and we were sure to be disappointed come morning.